My wife Katerina and I have been coming to the Emerald Coast for years! Now that we have two small girls, we have continued that tradition with them. We live in Memphis, TN where Brad home schools the girls and is self employed and Katerina is a Pharmacist. We chose Unit 504 at the Islander Beach Resort due to it's location. This condo is on the beach and as close to gulf as you can get. 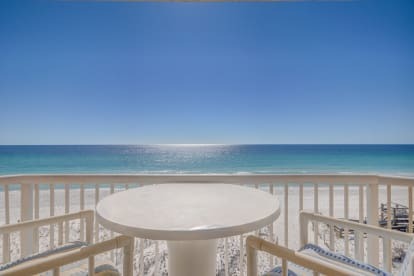 The views from the condo are the best views you will encounter on Okaloosa Island. You have unobstructed views of the beach and gulf. From the condo, all you hear is the sound of waves crashing on the shore and occasional sea gulls. It's also really close to the Gulfarium that the kids love and tons of places to eat and shop, that we love.